Welcome back for week two of our “Take Back Your Time” challenge. I hope that week 1 was a huge success for each of you and that you are feeling a little bit more in control after having scheduled some things out in a concrete way. So what’s next? Well, I know that making that schedule is not all that needs to be done to make it a success. Following the schedule is the hardest part! The next challenge will help you keep that goal. This week our challenge is to create a meal plan, or several if you are feeling wild enough, so that we are prepared every day. Now I don’t know about the rest of you but there are times when my day has been long, I am exhausted and the thought of cooking simply drains me. To make matters worse it is as though my brain just shuts off. I can look at all the food we have around the house and not be able to think of a thing to make! Have you been there too? Well you are not alone. This week we are going to work to create a meal plan so that we know exactly what we are making every day for every meal. Planning these meals ahead takes pressure off of you and also allows you to determine in advance that you will have all the materials to create it on hand. I follow a wonderful blog entitled livingwellspendingless.com and the author of this blog has a fantastic spending freeze challenge. The challenge is set up so that you won’t spend any money for a whole month! 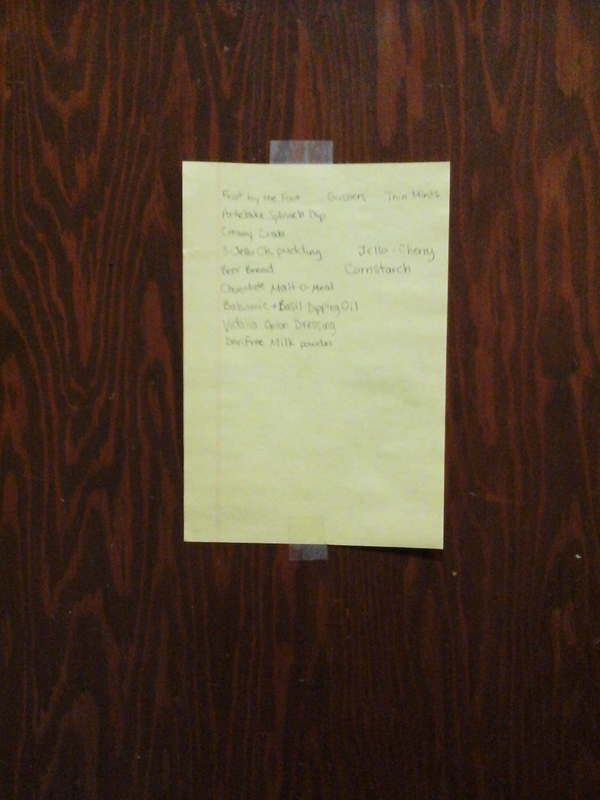 The greatest part is that she encourages you to inventory your pantry and to plan meals from this list. So let’s start with inventory! This is one thing I never used to do before I started reading the above mentioned blog. Once I did I found out I was doing pretty well, aside from a few cans of expired sweetened condensed milk and having THREE cans of baking cocoa. What in the world will I do with all of this baking cocoa?!?! Starting your inventory is simple. Go through each cabinet, shelf, box, whatever it is that you use and write down everything that you have in terms of food. For me this also led to re-organizing my cabinets a bit so that all of my baking items were together. I posted lists on the inside of my cabinet doors with which foods could be found there and how much of each. Do this in PENCIL so that you can erase instead of creating a whole new list whenever something is used up. With your inventory complete you should feel a bit more in control. Next what you will be doing is brainstorming! Look at that food list and generate as many meal ideas, which your family likes, until you simply can not think of any more. If this is something that is difficult for you I have included a long list of some of my families’ favorite meals. Next you will start by placing those meals you thought of onto a calendar or weekly meal plan schedule. This will make meal planning and prep a time saving event for you. So how do you save some time by planning ahead? We have decreased our stress since we already know what we are going to make. Saving time is just a step farther. Place meals strategically in certain orders. For example, once a week I will cook a whole chicken. After that meal is complete we always have plenty of chicken left over. The meat is already cooked so I simply take a few minutes to pull all the remaining meat off of the bird and stick it into either the refrigerator or the freezer (label it if you are not using it the same week). Then I know that a meal, usually within the next two days for us, will be using up part of that chicken. It could be chicken pot pies, chicken soup, or chicken and rice or pasta. The point is that by planning my meals a certain way I am able to take time out of the cooking and prep process by using things that I have already done. In the above scenario that would be cooking that chicken. So now you are ready! Grab a pencil, some paper, and tape if you plan to hang them like I do and head to your food storage location. Once you have taken an inventory of all of the foods you own start planning meals that use up those materials. Not only will doing this save you money but also time since you won’t have to purchase the supplies you need for your meals. If you do need to purchase any foods you will be able to make one quick trip to the store since you will have the list for the entire week’s meals. I plan my meal schedule out a whole month whenever possible. I juggle the meals sometimes based on what I find on sale. Plus when I find items on sale I know about how much I am going to need so that helps me know how much to buy. Win-win right! So there you have it! Week 2 of “Taking Back Your Time” will soon be complete. I have also included a few of our family go-to meal ideas that we use often. Try keeping a list of your families’ favorites in a drawer as well so that you won’t stress yourself. Happy Meal Planning and I will see you next week for challenge part three!! !